Does North Korea have an EMP bomb already in orbit and ready to be detonated? If it ever happens, you may regret surviving it. When I first sat down to research this story, I thought that America had no real enemy capable of using an Electro-Magnetic Pulse (EMP) weapon. It seemed like something out of a science fiction movie. Sure, I know that the Sun can cause this type of energy burst, but could a nation develop such a horrific weapon? Wow, was I naive. The military already have electromagnetic missiles that cover local targets. That's not what we're talking about here. This story has even more relevance after the successful detonation of a MINIATURIZED nuclear bomb on Ferbuary 2013 and the subsequent upgrade to an H-Bomb in 2015... and in 2016 North Korea successfully put a satellite with unknown cargo into an orbit over continental USA. Their detonation of a huge thermo-nuclear bomb in 2017 is worrisome enough but the successful detonation of miniaturized nuclear bombs plus the advances in long range ICBM missiles is a combination of factors that has the world on edge. Check out the current orbit of South Korea's KMS4 EMP satellite HERE! Currently, North Korea has the capability to launching a ballistic missile high into the atmosphere and into space orbit, but 'no worries' (we are told)... officials say they have not yet developed an accurate re-entry capability. Well guess what? For an EMP weapon it does NOT need to re-enter the atmosphere to be effective. Even more troubling is the fact that all of our defensive systems are designed to target a potential warhead as it re-enters the earth's atmosphere -- not before. As you will see, this is a recipe for disaster. A weaponized EMP (bomb) is made to detonate high in the atmosphere. I'm talking hundreds of miles up there. It's possible to use an ordinary nuclear bomb for this. It's very low tech. The explosion releases certain energies that spread out and radiate a large area underneath it. The higher up it happens, the more the radiation can extend beyond the curve of the horizon. The effects, while not radioactive per se, are even more lethal. The electromagnetic pulse contains enough energy to destroy anything and everything electronic. Think of it like a powerful lightening bolt. And when I say destroyed, I mean burned out and not repairable. But even if your cellphone, radio or computer was still somehow working, there would be no electrical power in the grid -- for a long time. All of the transformers would have to be replaced and new wiring installed. And, of course, the generators themselves would need to be rebuilt. Our cars, trucks and entire infrastructure would be gone -- in an instant. An electromagnetic pulse (EMP) weapon is far more dangerous and potentially more lethal than a nuclear bomb. We known that the Russians have EMP weapons because of their published (an sometimes not) research and experiments with the technology. And now, of course, we can include China. But really, any nuclear capable nation with an atmospheric delivery system can do this. "China's military is developing electromagnetic pulse weapons that Beijing plans to use against U.S. aircraft carriers in any future conflict over Taiwan, according to an intelligence report made public on Thursday. A declassified intelligence report, obtained by the private National Security Archive, provides details on China's EMP weapons and plans for their use. Annual Pentagon reports on China's military in the past made only passing references to the arms. "For use against Taiwan, China could detonate at a much lower altitude (30 to 40 kilometers) ... to confine the EMP effects to Taiwan and its immediate vicinity and minimize damage to electronics on the mainland." "North Korea's last round of tests, conducted in May 2009, appear to have included a "super-EMP" weapon, capable of emitting enough gamma rays to disable the electric power grid across most of the lower 48 states, says Dr. Peter Vincent Pry, a former CIA nuclear weapons analyst and president of EMPact America, a citizens lobbying group. Samore, who handles arms control and non-proliferation issues, warned that "additional strong sanctions will be imposed on the North with the support of Russia and China." North Korea's nuclear tests have been dismissed as failures by some analysts because of their low explosive yield. But Dr. Pry believes they bore the "signature" of the Russian-designed "super-EMP" weapon, capable of emitting more gamma radiation than a 25-megaton nuclear weapon. Pry believes the U.S. intelligence community was expecting North Korea to test a first generation implosion device with an explosive yield of 10 to 20 kilotons, similar to the bomb the U.S. exploded over Nagasaki in 1945. He said, "So when they saw one that put off just three kilotons, they said it failed. That is so implausible." The technology for producing a first generation implosion weapon has been around since 1945, and is thoroughly described in open source literature. In December 2012 Pyongyang announced plans to launch another rocket in a fresh attempt to send a "satellite" into orbit. Just two days after announcing that the launch window would be extended due to technical issues, a long-range rocket lifted off from a launch site on the west coast of North Korea. Amid a chorus of international criticism, Pyongyang declared the mission a success and says a "satellite" was sent into orbit. Theoretically. an orbiting EMP bomb in the form of a simple, low yield nuclear weapon, would certainly be a game changer. I want to emphasize this: Unlike nuclear bombs that can destroy a large city like New York or Los Angeles, an EMP weapon is so effective that just one -- detonated over the central USA -- could knock out the entire mainland. That's right -- just one! Everything electronic would be gone. Think about it. More reasons to worry about North Korea? Since a fusion reaction produces mostly neutrons, and very little radioactive debris, the concept of a 'clean' bomb has resulted: one having a small atomic trigger, a less fissionable tamper, and therefore less radioactive fallout. Carrying this progression further would result in the suggested "neutron bomb", which would have a minimum trigger and a non-fissionable tamper. There would be blast effects and a hail of lethal neutrons but almost no radioactive fallout. This theoretically would cause minimal physical damage to buildings, equipment and infrastructure but would be highly effective at killing most living things. But this idea has developed even further. The theorized "cobalt bomb" is, on the contrary, a radioactively "dirty bomb" having a cobalt tamper. Instead of generating additional explosive force from fission of the uranium, the cobalt is transmuted into cobalt-60, which has a half-life of 5.26 years and produces energetic and highly lethal (and thus penetrating) gamma rays. The half-life of Co-60 is just long enough so that airborne particles will settle and coat the earth's surface before significant decay has occurred, thus making it impractical to hide in shelters (unless one has supplies to last a decade or more). This prompted physicist Leo Szilard to call it a doomsday device since it was capable of wiping out life on earth. Such a doomsday device might be made and used as the ultimate threat in a political stand-off, effectively saying to the world, "Do as we say or we all die!" And it need not be put into the atmosphere. A simple ground based detonation would be sufficient to blast the cobalt-60 into the atmosphere where prevailing winds would carry it around the globe, turning Earth into something like Mars. Of course, a country would have to be crazy to do such a thing... hmmm. EMP -- the worst weapon you will ever survive. When I was a teenager I was a ham radio operator. I listened to my short wave radio for hours just about every day. I remember one summer in 1962 when I thought my receiver was broken; I even bought new tubes for it. On every band, on every frequency, there was a loud and annoying hiss that lasted for a couple of days. Communication was impossible. No one spoke about it on the news, nothing was written -- it was "top secret" at the time -- but I later learned that it was the result of an atmospheric nuclear explosion. The 1.4 megaton detonation, called "Operation Starfish Prime" [right] occurred 250 miles above Johnston Island in the Pacific. Not only did the explosion shut down short wave radio communications in America, but it also overloaded and blew out over 300 streetlights in Oahu, Hawaii -- some 740 miles away! Scientists learned that nuclear explosions, in addition to the blast, heat and deadly gamma radiation, also produce a strong electromagnetic pulse that is capable of passing thousands of volts of electrical energy to just about anything that conducts electricity. The pulse is generated by the interaction of gamma rays, released by a nuclear explosion, with the atmosphere and the Earth. Called the "Compton effect", the resulting pulse is like a radio signal and any metallic object acts like a receiving antenna. Whereas a radio signal might produce a thousandth of a volt or less in a receiving antenna, an EMP pulse produces thousands of volts. Antennae, pipelines, underground gas and water pipes, metal fences, iron railroad tracks, power lines, telephone wires, electric cables -- all suddenly act like antennae and become the recipient of huge currents, starting fires, explosions and frying all forms of circuitry beyond repair. Because our bodies do not conduct this current, the EMP does not directly harm humans or other living organisms. But, as you will see, that's not necessarily good news. Back to the stone age... in 1 nano-second! Look around you. Right now you are using a computer. You probably also depend on a cellphone and, most likely, you have a car to get you from home to work or to the market. Most vulnerable to this high current of EMP are transistors, those small devices that are inside computer chips, radios, cellphones, ATM machines, automotive ingnition systems, the gas pumps, calculators, lights, clocks and just about everything that requires batteries. All of these would be useless after an EMP and repairing them would not be an option. They would all have to be trashed and replaced. 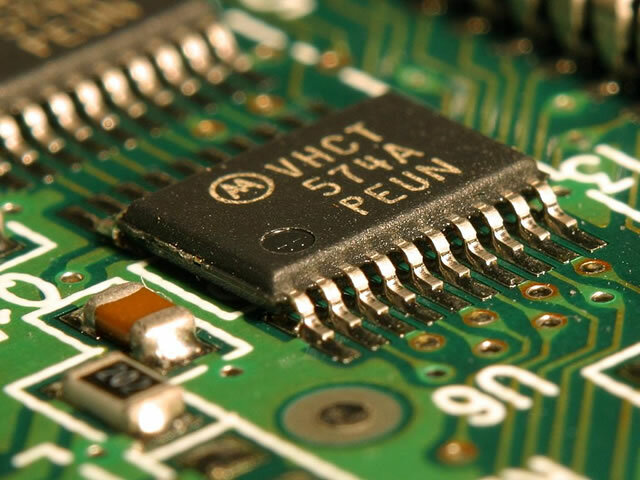 An EMP lasts just 1 nano-second! It radiates at 50 kv/m at the speed of light. At such a high altitude, it could happen in the blink of an eye and might not be immediately associated with any type of explosion or blast. Imagine surviving an EMP only to find you cannot call your family to see if they are safe, cannot get cash from your ATM or bank (since they cannot access your records), cannot buy food at a supermarket (no scanners) or even drive your car (ignition destroyed). Everything relying on modern electrical technology will be useless. When you finally walk to your home, city water will not be pumped, lights will not come on, sewage treatment will be off-line, heat and air conditioning will be gone and the production, harvesting and transport of food will have come to a grinding halt. What's even worst is that the lack of radio and television news will keep most people from understanding what has happened or how to respond. Confusion and eventually anarchy would reign. This is the reality of an EMP weapon. If an EMP device were detonated, most of the electronics that control our many nuclear energy plants would be destroyed. With no way to control the fission reaction these nuclear plants would eventually run away, reach critical states and melt down, releasing nuclear material in explosions similar to those in Fukushima, Japan. There would be no way to shut them down safely or regulate cooling systems. Victims of an EMP explosion would suffer a nuclear nightmare. 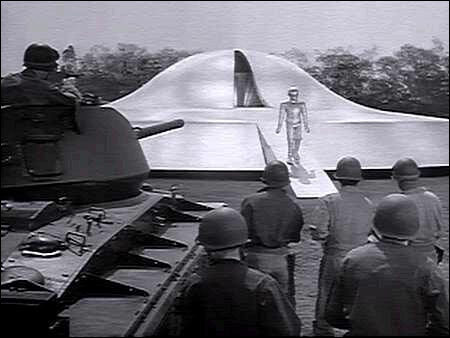 [above] In the film "The Day the Earth Stood Still," an alien visitor stopped every electrical apparatus all over the globe as a demonstration of his power. An EMP, although not effecting the entire world, would cause a similar catastrophe. Can't we shield against this somehow? It is possible to shield electronic equipment from EMP radiation, but it is extremely difficult. The protected components must be completely enclosed in a copper shield. Even a small hole will allow the radiation to enter and any wires extending outside the shield will defeat the protection. For all practical purposes, this is not possible. John Kappenman, the chief science adviser to the US EMP commission, believes it would require just $1 billion to harden an estimated 5,000 power transformers around the country to shield them from the impact of an EMP-like event. Air Force One, the President's jet, and certain other strategic aircraft have been equipped with special shields to reduce the effects of the radiation. Oddly, old radio equipment using vacuum tubes are less likely to be hurt by the radiation than transistor circuitry and many existing Russian aircraft still maintain these old systems for this reason. 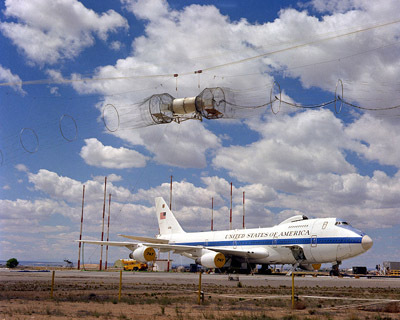 [Above] Special Air Force E-4 being tested for EMP shielding. Just one is all it takes. This threat is not imaginary. The House Armed Services Committee issued its warning to Congress on July 10, 2008 citing the fact that the Russians have already tested small yield EMP weapons of 300 kilotons at altitudes of 60, 150 and 300 kilometers and produced the effects described above at distances up to 600 kilometers from the test site. An actual weapon would be many times stronger. 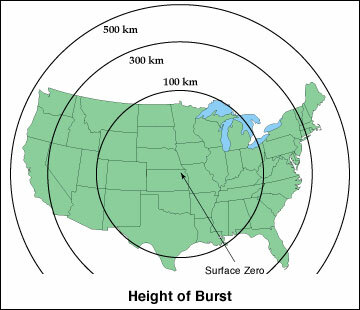 Areas of medium yield EMP destruction with a single burst over Kansas at 100, 300 and 500 km. The scientists describe three possible EMP effects, depending on the height of the detonation. 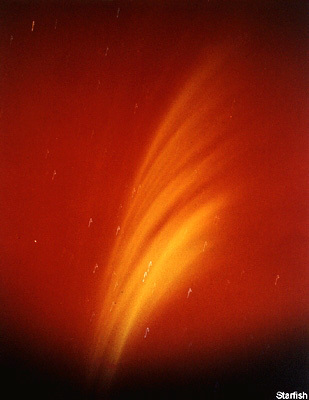 Because the gamma rays travel in a line of sight path, the most dramatic effect comes from a high altitude blast. Here, the gamma rays can travel further and the Earth's magnetic field deflects the pulse back to the surface. Such an attack could easily be launched from a submarine, just off the coast, and need not be accurate. The altitude and coordinates of detonation can vary widely and the effects will be just as lethal to the electronics. If several are launched, the chances of one reaching its optimum height is almost guaranteed. Once the EMP has been discharged, the circuitry of subsequent missile eletronics will be useless, leaving the victims vulnerable to more attacks. The House Armed Services Committee confirmed that these weapons do not need to be accurately targeted to destroy our infrastructure. A medium size nuke, detonated from between 150 and 500 miles anywhere over Kansas, would be enough to destroy a hundred years of technological development. By comparison, the space shuttle and space station orbit about 110 to 150 miles above Earth, well below the optimal detonation of a potential EMP weapon. An orbiting nuke could possibly already be poised, waiting to be used in a future conflict. If such a weapon is already up there, it is completely beyond our current capability to destroy it. Once it is detonated, our remaining electronic defense systems would be relatively useless. Checkmate.
" The U.S. society and economy are so critically dependent upon the availability of electricity that a significant collapse of the grid, precipitated by a major natural or man-made EMP event, could result in catastrophic civilian casualties. This vulnerability, if left unaddressed, could have grave, societal altering consequences." --Rep. Trent Franks, who authored the SHIELD Act. As usual -- there's more! Recently, scientists have developed a way to produce an EMP weapon without fissionable material. These non-nuclear devices are smaller than nuclear fueled pulse generators but their effect can be just as effective over a limited geographic area. In the apparatus above, power is supplied by a bank of capacitors. These capacitors are similar to the system used to power a strobe flash. 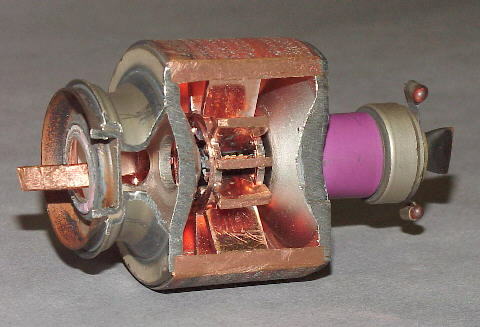 The ignition first charges the large coil, producing a magnetic field. Then an explosive charge begins at one end of the coil, shorting the coil by compressing it against the metallic shield. The effect changes the inductance of the coil, essentially shortening the field as the explosion advances down the tube. The resulting electromagnetic pulse has a wide spectrum of wavelengths, capable of energizing metallic objects of varied lengths, from hundreds of feet to a few inches. All of the artificial "antennae" then become charged with enormous electrical currents which burn and render their components useless. This type of non-nuclear apparatus is almost impossible to detect but is limited in scope and power by the size of the charging capacitors. [above] Inside an industrial magnetron. Some smaller devices could easily be made by terrorists. In fact, a simple search of the internet yields plans and specifications for constructing small EMP devices from readily available components such as the megatrons from industrial microwave ovens, rated at 800 to 1200 watts, and several automotive batteries. These devices are said to be able, with the addition of a parabolic reflector, to disable the electronics of a modern car or truck within 200 meters. Commercially sold shock wave generators [right] are capable of producing focused acoustic or electromagnetic energy that can break up objects such as kidney stones and other similar materials. EMP generators can produce pulses of electromagnetic energy that can destroy the sensitive electronics in computers and microprocessors. Destabilized LCR circuits can produce multi megawatt pulses by using an explosive wire disruptive switch to achieve an effect similar to larger EMP devices. The point here is not to make you go out and build an EMP weapon. It is to make you aware that the technology is very real and that we are currently extremely vulnerable to the effects of this type of weapon. Nations, like the US and Russia, have already developed these weapons on a scale capable of devastating our modern, technological dependent civilization. Should you be paranoid? Well, I know some people who have stopped putting their money in banks and have started storing food and water. Collecting books on farming and gardening is another good idea. Some are even exercising more, getting ready for long walks along deserted highways and roads.